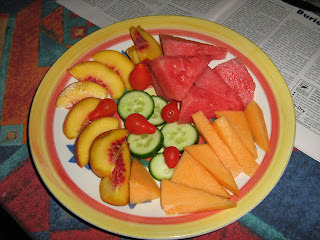 The road to weight loss, colourful though it may be, is not an easy one to travel for a chocolate/sugar addict such as myself. In my home, right now, there is no chocolate. There are no M&M's, no Clinkers, no Maltesers. No biscuits, no dessert packets of self-saucing puddings to bake, not even a can of sweetened condensed milk. No licorice bullets, no choc-coated peanuts, no glazed almonds. 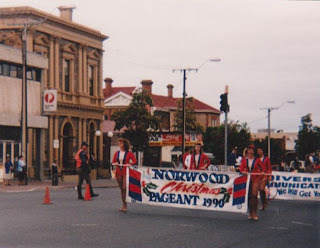 Yesterday was Norwood's Christmas Pageant day. I'd hoped to take photos, but I was rostered on to work at the same time as the pageant was making its way down The Parade. Instead, I bring you.... Christmas Past. These girls danced, high-kicked and cartwheeled the entire time. The Gingerbread House. This car had Christmas Carols on loudspeaker. I do love Christmas Carols. "Things go better with Coke." Everyone remembers that old jingle, right? The Greatest Show On Earth, single handed. Even Con the Fruiterer made an appearance! The Pudding. I'm the only one in my family who likes christmas pudding. Four kids, and not one of them shares my taste for pudding! Oh well, more for me. I see on my sidebar I have 30 followers. I know most of you from visiting your blogs, but there's a few names I don't recognise. Naomi; Alisi's Mummy; Dave; James Deagle; Kezz; Sarah.Murray. Could you perhaps leave a comment so that I can click over to your blogs for a visit? Maybe I've already been there and just don't remember, but I'd like to come back for another look. Thank you all so much for following. I never expected to have more than a handful of followers. I've been doing a lot of crying lately. Clearly I don't have the control over my emotions that I used to have. It's like a flood back here. In the past, I've watched movies and TV shows that had the potential to be tearjerkers. You know the sort, where you settle down to watch, but make sure the new jumbo-sized box of tissues is right there beside the choccies. But while I've felt the emotions, I haven't cried. Now? Holy heck, batman! I'd better buy some more tissues!! I've watched several TV series, Criminal Minds; Stargate; Bones; and gotten to know and love the characters. Movies too. So now, when the characters I love the most are having problems, I cry. When they're in danger, I cry. When something good happens to them, I cry. But I don't feel bad about this. It's actually a relief to be able to do this. I'm supposed to write a post here about a blog I like, telling you a little about it and why I like it. Well, I'm not very good at saying why I like something, all I know is "it appeals to me", or the blogger makes me laugh, or they write in a style that keeps me coming back, about things that I like. Families, daily life, current events, things that go bump in the night. All these and more are among the many blogs I enjoy following. So instead of telling you all about Lori, I'll put her address here and let you all pop on over and see for yourselves. Singing and me are not a good match. As promised by my little computer weather icon, today is cloudy, cool and rainy. Woo-hoo! I knew it was raining when I left work, but wanted that cool wet feeling, so left my spare umbrella in my locker and walked on home. Bliss!! On the way home, I saw a semi-trailer with a sign reading "Don't Privatise SA Forests", and something else that I've forgotten, something about killing small communities. He was stopped at a traffic light and I pointed to his sign and gave him a thumbs up. He nodded and gave me two thumbs up in return. Now I'm sitting here doing this, with every door and window open to the cooler air. 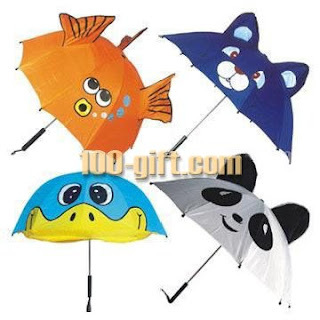 I love rain. The images above are from google, thanks to whoever put them there. 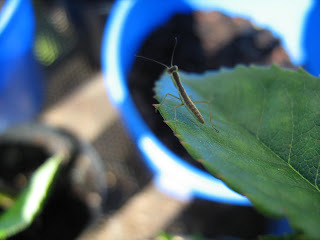 Like this baby praying mantis sitting on one of my rose cutting leaves. In the supermarket, cute cukes. Look at these little babies! Here's a couple against my hand so you can see just how small they are. And here's one sliced into my dinner salad. In other news, I've seen the orthopaedic surgeon again, and we've decided that I won't be having surgery after all. The tendon is torn, true, but the other tendons and surrounding muscles are managing well, I have a reasonable range of movement which will only get better as I keep up the exercises, and I'm coping well at home with day to day things. An operation would cause me unnecessary pain and once again limit my arm movement until it's properly healed, after 6 weeks in a sling. I can do without that if it really isn't necessary. I don't handle heat well. Sunnies? On as soon as I step outside. As soon as the temperatures get above 30, I get headachy. trying to get rid of the headache that kicked in about 10pm last night. and so far today, 8 panadols. It takes me most of the summer to get used to the heat. Then when autumn comes along and the air still stays hot, I get cranky. This is not my favourite time of the year. 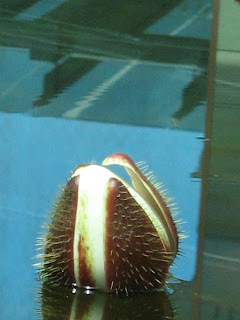 This bud is Adelaide's Amazonian Water Lily. I was told that it opens in the evening, around 5pm, and has a spread of about 60cm. I wasn't planning on staying around that long to wait for it, so I'll take their word for it. It lives in our Amazonian Water Lily Pavilion, a fancy glass structure that was built around the pond to replace the original pavilion, which was much the same size, but the glass wasn't clear, the entrance was smaller and the inside perimeter plantings much more dense. I liked it and this new one will take some getting used to. 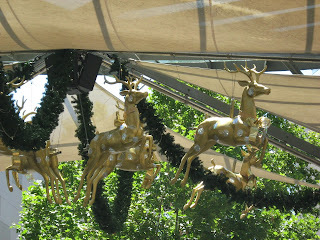 We can look at some more of the decorations in Rundle Mall. and look at this cute little snowman twirling slowly from left to right and back again, smiling at the people. This Santa biscuit barrel, (cookie jar), is part of a window display in Harris Scarfe. Here's the reindeer at the entrance to David Jones department store. Inside the store somewhere is Santa's Magic Cave. Would you like to visit the Botanic Gardens now? This big old peppercorn tree is right beside the entrance gate, it's one of my favourite trees. I love how the trunks and branches get all gnarly and easy to climb. A lionhead drinking fountain, bright red so it stands out, making it easy to find if you're thirsty. It guards the entrance to this trellised gazebo, which has windows on all sides with nice views, and seats to rest on too. title? you want a title for this? want to see what I've been doing? second attempt at long distance walking.